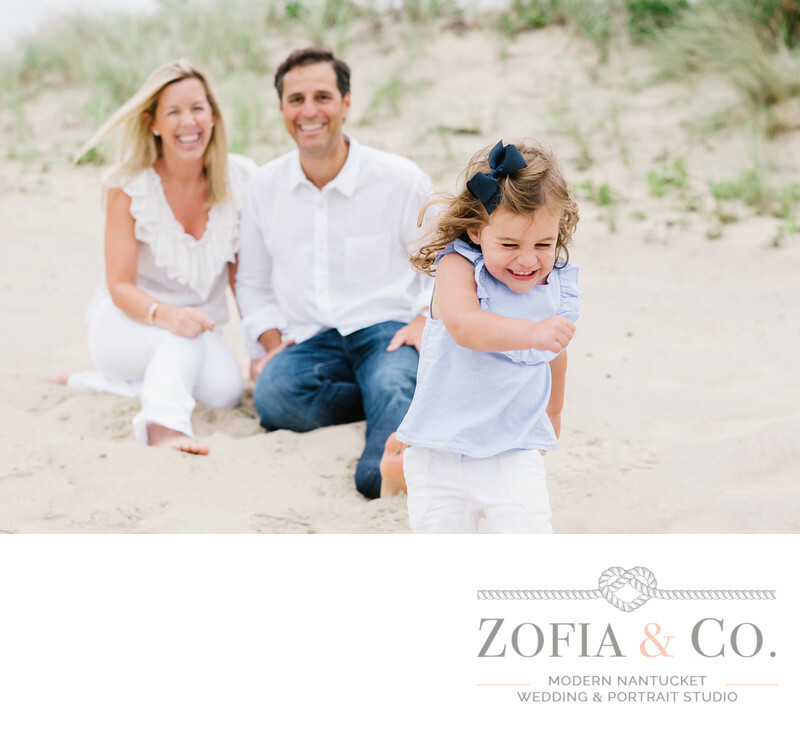 Nantucket families and vacationers have been coming to us for over a dozen years for their family portraits. 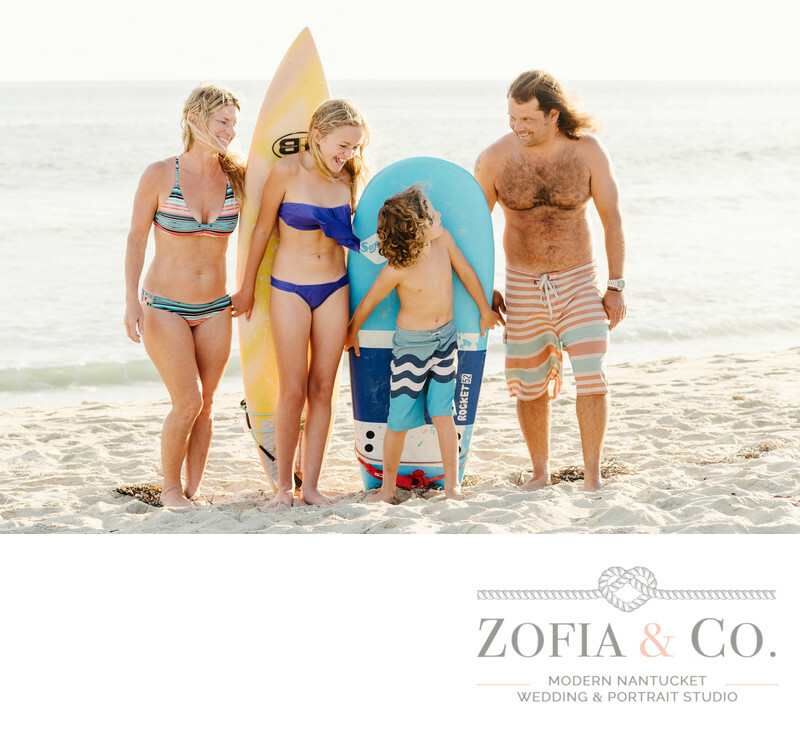 We are proud and honored that our wedding clients come back when they have little ones on the way, and families come back year after year to chronicle how their kids are growing. Our sessions are lifestyle, rather than formal sittings. We enjoy capturing moments of your children playing in the sand and water, interacting with their siblings, and cuddling with you. After taking a few posed photos, we allow your family to have fun while we preserve those real smiles that you love so much. We guide you to figure out what to wear, where the best light will be during your session, and help you feel comfortable in front of the camera. 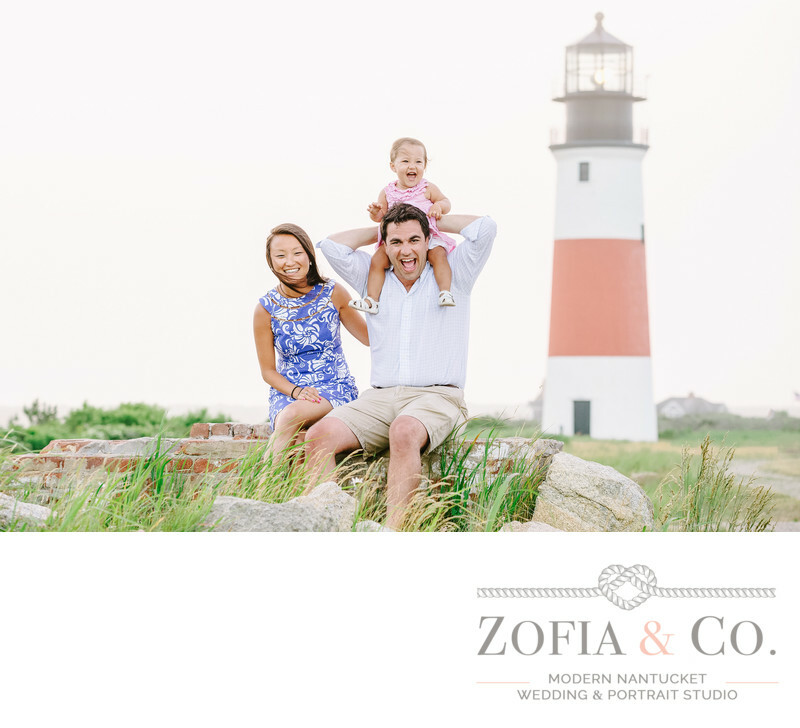 Our island offers us an endless supply of stunning backdrops for your session, from beaches, to lighthouses, to parks and playgrounds, and even your vacation home. We're happy to make a location suggestion based on what you like and how the weather is cooperating. We may even introduce you to a hidden spot you've never seen before. 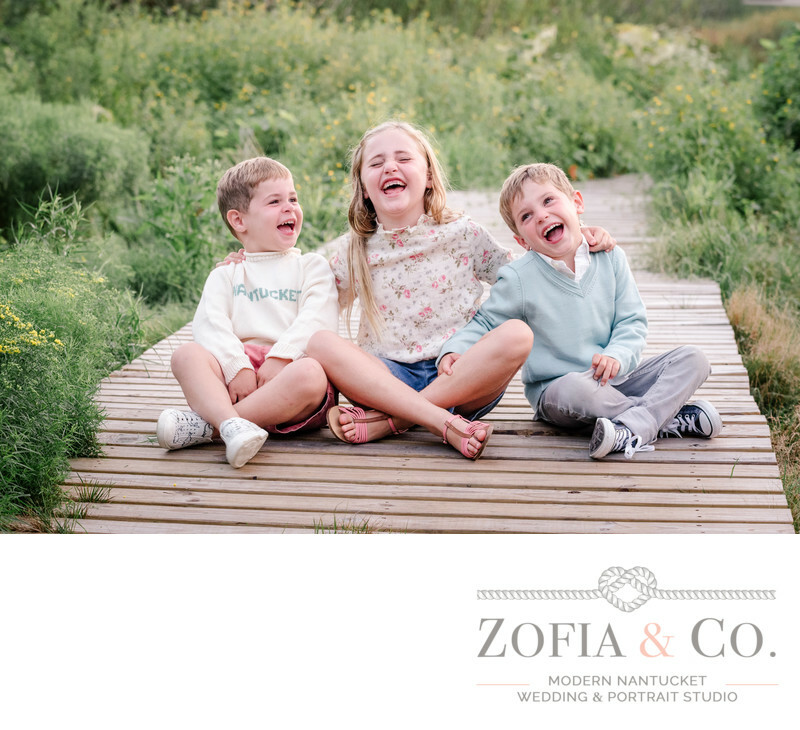 We have one hour or mini Nantucket Family Sessions that include an online ordering gallery, a credit towards prints and products, and digital print files via download. 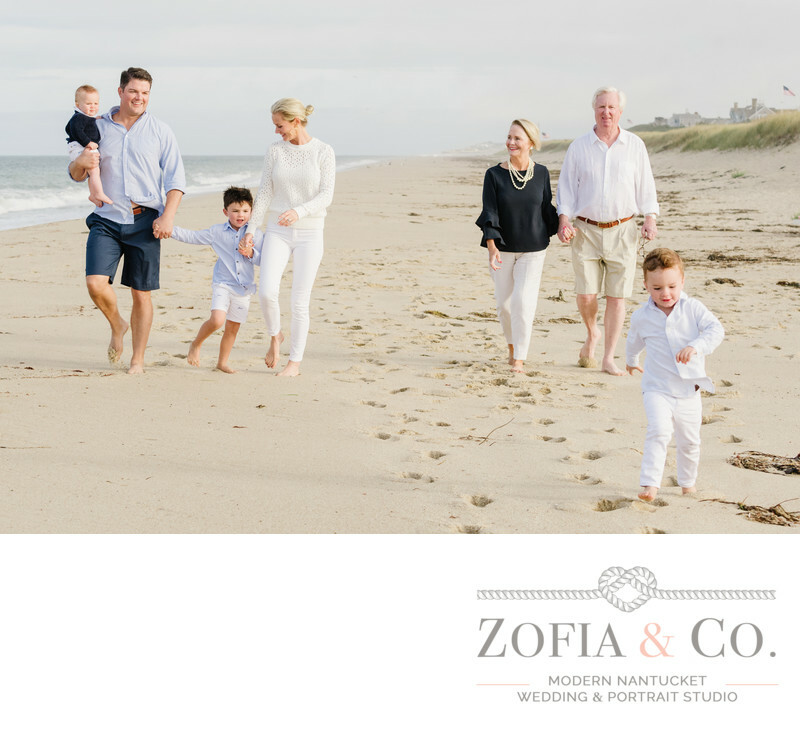 Our Year in the Life Collections for local, year round Nantucket families include a gorgeous PhotoBook at the end of the year. Year in the Life Collections may include maternity, newborn, baby, and family photography. Summer Family Portrait Sessions start at $950. Send us an email to get on our calendar! Do we get the digital files and how many? This is the #1 question we have received in the past 5 years. We include a curated set of individually edited, high res, digital files from your session. This is about 20-30 images for a mini session and roughly 50-80 images for an hour session. The number varies depending on how many family members are at your session and how expressive your group is. More is not always better. You really don't need 10 of the same moment, you need one or two best images from that moment. You may copy the files for safekeeping (and please do! ), print them for personal use (meaning you can't use them for commercial purposes that promote a business or claim them as your own in contests, etc). But you may not let them forever sit on your desktop until your computer crashes and your memories are lost forever. After you download the images, you can post them on social media (with credit to Zofia & Co.) and make prints at the lab of your choice. Of course you can also order directly through us, the little guy. We give each file special attention, and only work with professional labs that use archival ink and paper. You'll never be disappointed with fading or curling prints when you let us print your photos. What can we do with our print credit? Photographs are meant to be printed. Your print credit can be used towards any print or product in your online gallery until the expiration date, 6 months after your session. We want all of our clients have a professionally edited, professionally printed finished product when they work with us. All digital media fails and expires, printed photographs last! Consider it a little gift from us, a few prints to get you started. Who will photograph our portrait session? 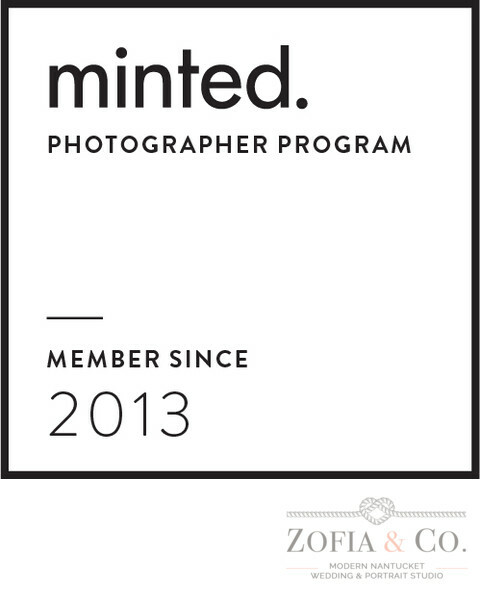 Zofia and Mark are both full time lead photographers with the same photography and editing style. We're both fabulous and we're both available to photograph portrait sessions. If one of us is already booked on your preferred date, another may be available. You may request one of us and we’ll do our best to accommodate. What's the best time of day for our session? An hour prior to sunset is best for flattering light on a sunny day. Softer shadows, less squinting, better background options. That golden hour is the sweet spot. However, if it's an overcast day, we may need to bump up your session by an hour or so. We're in touch with you a few days prior to firm up the game plan. We'll photograph your portrait session wherever you'd like, though we have some favorite spots if you need suggestions. The main factors when choosing a location are wind direction and shade, if you need to be photographed earlier than golden hour. Some locations can be super busy in the summer (Brant Point! ), so if it bothers you to have a bunch of other families and photographers in the background of your photos, we'll suggest a quieter area. We like you to coordinate but not match like a baseball team unless that’s your tradition, in which case by all means. Remember that you’ll likely be sitting, so something comfortable. You might even end up dipping your feet in the water. All white is just fine, if that's your family tradition, though we'd suggest you mix it up by throwing in another color or two. Black collects every speck of dust and pet hair- so we don't recommend it. If you're including small kids, some wipes for their noses is always smart, as is a change of clothes and layers if it's chilly. We always say you should wear something that makes you feel really good. We'll look for another good time during your stay. We're pretty flexible. But if your entire trip is a wash, you have a year to reschedule with your booking. We don't think we photograph well, can you help warm us up? Absolutely! We start every session chatting with you and your kids, breaking the ice, and taking some natural photos of you all interacting and playing before posing you. Once we do pose, it’s so casual, you won’t even know you’re doing it. We'd rather you photograph us eating ice cream for our vacation photos. Can you do that? YES. We have a few families who have done the lighthouse photos, and we now photograph them surfing, fishing, bike riding, swimming, going for ice cream and scalloping. Whatever it is you're into on vacation, we're more than happy to incorporate! How soon do we see our photos? You will receive your online ordering gallery as well as your downloaded images in about 1-2 weeks. Can my family order prints too? Yes, anyone you send the online ordering gallery to may order edited prints and products directly through us. Can we order holiday cards? We have a storefront at Minted. Just ask us for any or all your images to be uploaded there, and then Minted will notify you with instructions. They have tons of beautiful templates and card options. We use them for our own cards, too! Our child is sick, can we reschedule? Yes, pleeeease. Sick kids are not particularly camera happy. We'll gladly let you reschedule within a year of your original session date at no fee. How far out do you book up your portrait calendar? Our calendar fills up about 4-6 weeks prior in the summer, and even earlier for the busiest weeks. If you’re trying to book last minute, one of us may be available. The bulk of our portraits are photographed in 2 short months, and only midweek Monday-Thursday. We average about 100 sessions within that time. How do we secure our family portrait session with you? Our booking and payments are all done online, it’s easy! REACH OUT WHEN YOU HAVE YOUR NANTUCKET TRAVEL DATES READY!